…and when I say ‘socks’ I’m referring to those cut-off, ½ calf knee socks you’re wearing with your lederhosen. 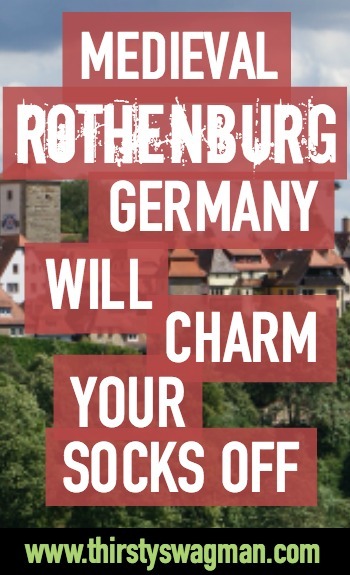 Two days of our upcoming Beer or Bust tour take place in Rothenburg, Germany, a small town probably less familiar to you than Munich but not at all lacking in charm or unique imbibing experiences. Located just a couple of hours north of Munich, Rothenburg ob der Tauber is one of Europe’s best preserved medieval towns. With both a cutesy fairy tale-like setting and a museum dedicated to barbaric torture devices, it’s like a town straight out of the world of Hans Christian Andersen but also a little bit of George R. R. Martin—something for everyone! Rothenburg, Germany exists as the real-life version of what you picture when you imagine the towns in your favourite fairy tales. All the cute of the half-timbered houses and cobblestone streets but not-so many wicked old witches. They’re never invited on tour. Some of the highlights include the 13th century town hall, St. Jacob’s church, and the 15th century Council Tavern and astronomical clock telling you it’s 5 o’clock somewhere. You can recover from that Oktoberfest Munich madness with some botanical zen in Rothenburg’s Castle Gardens, take the walking tour around the old town via the original medieval walls, and check out the bird’s eye views and red rooftops from the Town Hall tower, all zipping you right back to the glorious time of knight’s tales and pints of ales. Rothenburg’s Plönlein or “little square” serves as the poster image of this adorable (or terribly macho, depending on your preference) German village. Easily the most picturesque spot in town, come here for shots of the area’s two 13th century towers and most famous intersection. You know… where “long time ago” meets “far, far away”. The night watchman was once upon a time a lowly position akin to gravedigger or executioner, tasked with guarding the town against fires during the night while fighting off drunks and thieves. Geez, and you thought you had it bad. But today, Rothenburg’s night watchman is a sort of medieval rock star charged with leading Rothenburg’s most popular activity: the Night Watchman’s Tour. Follow the Night Watchman, dressed in black and brandishing a highly dangerous weapon, around town while he describes medieval life in the most humorous way possible. This is why you came! Now go to Hell—they have great beer! Wait… huh? Specifically, Rothenburg’s 1,000-year-old tavern known as Zur Höll meaning “To Hell”… obviously. The foundation to this building was laid in the 900s and is today a popular and dimly lit spot serving great food and beer but bringing out the worst puns in all of us. Here’s a great stop for all you sickos in the group. No more fairy tale nonsense for you, am I right? It’s finally time for wicked queens, evil stepmothers, and whatever you call the people who make coats from puppies. Rothenburg’s Medieval Crime Museum explores 1,000 years of crime and (pretty brutal) punishment. Touted as the best of its kind, this museum explores and displays authentic relics from every aspect of medieval criminal justice including the primitive devices used to torture and execute so-called criminals. Clearly we’ve been talking about the real fairy tales this whole time and not the watered-down, sugar-coated versions we learned as children. 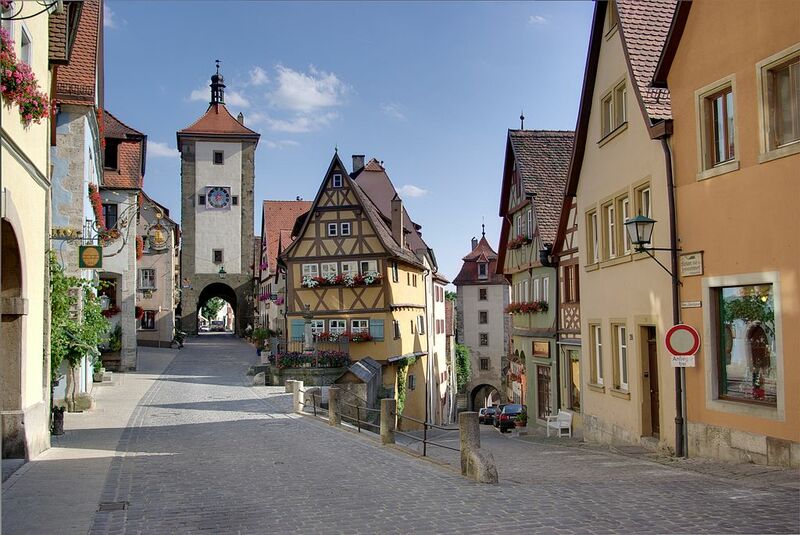 Want to live this real-life fairy tale in medieval Rothenburg? Check out our upcoming Beer or Bust culinary tour – we’ll leave out the trolls and ogres, I promise.